Blog Time to enter: 8th Annual Boat Decorating Contest! Time to enter: 8th Annual Boat Decorating Contest! The celebration continues with the Fourth of July celebrations on Manchaug Pond with the 8th Annual BOAT DECORATING CONTEST to be held Sunday, July 2nd! 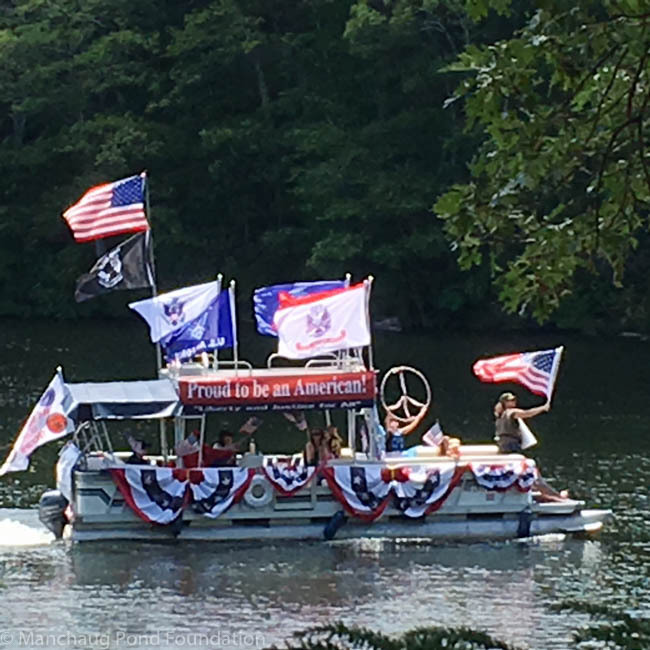 Manchaug Pond has a long history of boaters flying Old Glory, and blowing horns, trumpets and other noise makers in celebration as they “parade” around the lake! Let’s keep the tradition going with all boats both big and small, decorated or not, joining in the festivities. Register your entry to be eligible to win a trophy and cash prizes! Past competitors have decorated everything from a paddle boat and a kayak, to rowboats and jetskiis, to bowriders and pontoon boats with themes limited only by the imagination. Entrants will gather at 1:00 p.m near the Blueberry Island sandbar where the Judges’ Boat will begin reviewing all pre-registered entries. After the Judges’ Boat has had a good look at all the entries, we’ll do a slow cruise allowing full viewing of your artistically decorated entry and the crew’s acting ability and enthusiasm giving both the judges and all shoreline and roadside spectators a sight to remember! If you don’t want to be eligible for prizes you can skip the registration and simply join in the fun! Please hop in your boat and pull up as we go by or just cheer from the shore! Register your entry by contacting us providing the Captain’s name, telephone #, boat make & model, and decorating theme. You’ll receive a confirmation email with your entry number which must be prominently displayed on both sides of your vessel, visible to the judges. Winning entries will be notified by phone after the event and posted on the website. Trophy plaques and prize money will be awarded for 1st place ($75), 2nd place ($50), and 3rd place ($25) and presented at the Annual Meeting of the Members on Saturday morning, August 19th at the YMCA Camp Blanchard facility on the shores of Manchaug Pond. Check out our Fourth of July Gallery of past entries, visit the Manchaug Pond Pinterest boards for contest and patriotic celebration ideas and the Event page for details as to route and judging criteria. Celebrating 50 years of advocacy and action for Manchaug Pond!